In this post, a group of my colleagues and I briefly analyze the British Broadcasting Corporation’s (BBC’s) website on appearance, layout, navigability, bias, and a number of other factors. 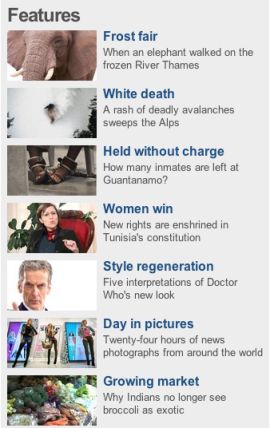 The BBC news homepage, at first glance, is organized and clutter free. With clear headers, it is easy to navigate to different subsections such as news, sports, and weather. The top story of the day is located in the top left because that is where the human eye naturally looks first. All of the headlines use key words with a corresponding picture that tells the reader exactly what they will find in the article. The multimedia found in the articles back up the written content. The pictures, videos, and slideshows are all big and eye-catching consistently throughout all of BBC’s articles. Each picture is given a header to clarify what the reader is viewing. In the bottom right corner of each picture, the source for each image is provided. The pictures used in the featured articles section on the sidebars can be distracting to the main focus of the article. At the same time, these images work with the headlines to help to clearly show the reader what the article is about. Hypertext is used sparingly throughout all articles. When hyperlinks are used, the reader is usually led to another BBC article. Links can be found to the right of articles to take readers to other related articles. On the bottom of articles that are reporting on developing news stories, there is a ‘more on this story’ section that links readers to previous articles on the topic. One major source of BBC.com’s credibility comes from the different languages that the site features, which equates into a very large global audience. The URL also changes from nation to nation, from BBB.com to BBC.co.uk when discussing information beyond the United States. The unbiased tone also creates credibility. The writer doesn’t necessarily identify with the audience, but rather presents the facts. Stories are written for quality and facts, and opinions from journalists are hard to find. 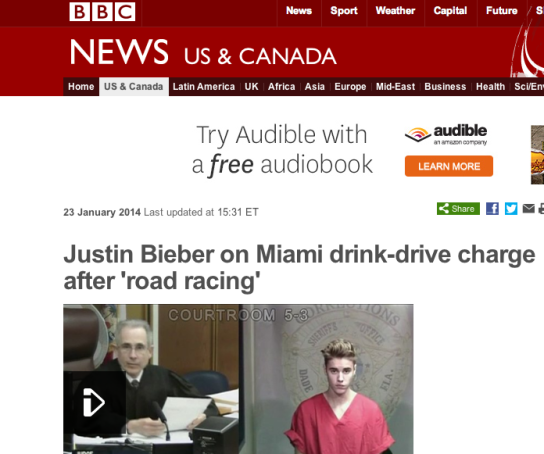 To prove our point about BBC’s factual tone, we compared BBC’s January 24, 2014 coverage of Justin Beiber’s arrest to the same story’s coverage on CNN.com. 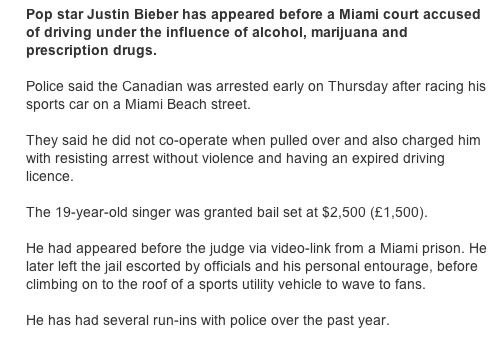 When comparing the two side-by-side, it was obvious that CNN’s article tried to depict Bieber as a hoodlum of sorts, while BBC seemed more like a police report. A users experience on BBC is convenient. For starters, the professional appearance of the site holds the attention of the reader. The title page which appears basic, changes in theme as the user enters a subcategory such as sports, food, or politics.This allows each article and subcategory to stand on its own, but still have a clear route back to the BBC homepage. Each article has high quality pictures, videos, and or slideshows to illuminate each story for the audience. The paragraphs and headlines are to a point which encourages scanning, an adaption to internet media. The links presented in the articles we examined were all functioning links that led to other BBC related articles. The general experience of BCC allows a user to quickly and efficiently connect to desired topics and news coverage. 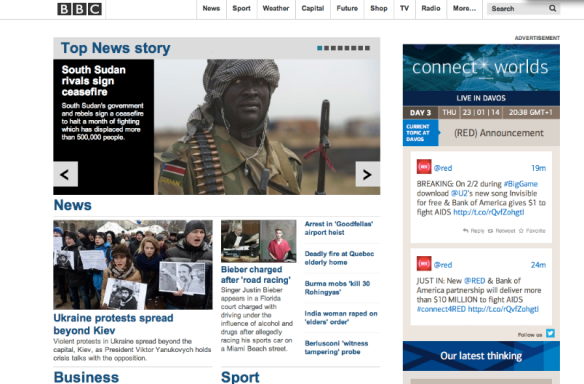 In terms of being user friendly, we would say that the BBC website is at the top of its game. I could only find a couple of things that I thought could be improved. BBC does a great job of providing hyperlinks that take readers to other BBC articles. Including some hyperlinks to outside sources, would help to improve credibility and give another perspective. 1. What qualities do you think a successful global network’s website should have? Which qualities are more important than others? 2. What do you think about BBC’s website?